La Quinta is a small resort community in the Coachella Valley, situated between the larger town of Indio and the Santa Rosa Mountains. It boasts 20 golf courses including several of the top 100 in the nation. The town appears to have come of age in the early 1960s with a park, mountain and the main drag named after Dwight D. Eisenhower, a favored war hero and president of the time. The residential area is tucked into a small valley among the foothills of the Santa Rosas which rise dramatically from the valley floor. There are two unnamed P1Ks on either side at the south end where the Top of the the Cove community park is located. There are almost 20mi of trails in the desert expanse south of the town, mostly over flat, easy ground, and very popular with the locals. I parked at one of the two trailheads, already half full though it was only 6:30a on a Monday morning. My first goal was the easier of the two, the lower summit to the east, barely a mile and a quarter from the parking lot. The route I followed up a steep drainage was surprisingly enjoyable. A use trail led across a levee from the parking lot and across the drainage I would use. There were plenty of footprints leading up the wash initially, but these petered out the higher I climbed. Eventually I was left in the unfrequented upper reaches where some short, dry waterfalls added some class 3 fun to the mix. I spent just under an hour to find my way to the highest point. John Vitz had left a register in 2007 and the 16 pages of entries attested to its popularity, climbable from pretty much any side. Haze and glare marred the views SE towards the Salton Sea, but views in other directions were quite nice including the Santa Rosas to the south, the day's second peak, Coyote BM, to the west, and La Quinta and San Jacinto to the northwest. Some rather green ocotillo cacti were found scattered about the summit area, a reminder that I was close to Anza-Borrego Desert Park and the southernmost reaches of the state. The descent took another 50min, getting me back to the trailhead by 8:30p, just after a large hiking group had headed out from the same starting location. This higher summit is located about 2.5mi to the west and another 1,000ft above Peak 1,601ft. I could have driven the 1/3mi to the second TH but that seemed a bit weak, so after grabbing more Gatorade I left the car where it was and took off again heading west. Aside from the well-manicured homes found throughout the area, a sure sign of a well-funded community can be seen in the 2mi-long Bear Creek Trail that originates from the second TH and heads north along another levee designed to prevent flash floods from decimating the area. Rather than the compacted sand/dirt or asphalt pathways that other cities might build, this bike/pedestrian is far more pricey poured concrete. Immediately south of the TH is an immense concrete structure resembling a reservoir but with no gate to actually hold water. Instead, it has a large catch basin and a restricted opening to limit the amount of water that can flow down Bear Creek during a flood event, very nicely engineered, I might add. I crossed over dry Bear Creek and up the other side of the levee where I came across a network of trails west of the catch basin not shown on the trail map at the TH. Someone, or persons, have made the 2/3mi walk west to the base of the mountain much easier than it would otherwise be, riddled as the place is with rocks almost as if left from a volcanic eruption. In places the trails are neatly lined with rocks, evidence of a great deal of patient work. Leaving the trails, I started up the slopes in front of me, almost 2,000ft of climbing in less than a mile. Though not technically difficult, the East Ridge proved a steep, challenging route, taking me an hour to reach the summit at just over 2,600ft. Along with the remains of a wooden survey tower I found a simple register consisting of a single page left by Vitz in 2012. A local La Quinta resident had signed it back in April as the only other entry. As one might expect, the views here were better than the first summit. 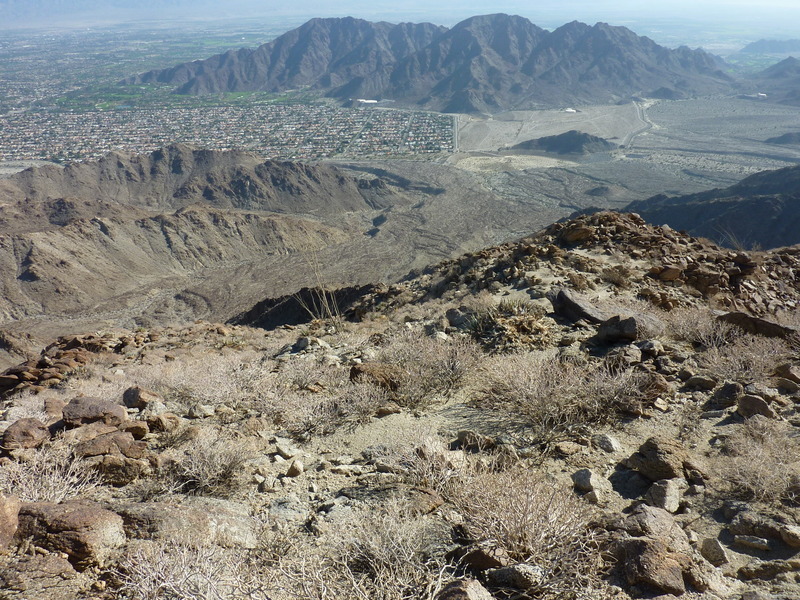 There is a sweeping view of the Santa Rosas from Rabbit Peak in the south, Toro Peak in the center, San Jacinto to the northwest, Palm Desert and a handful of other desert communities spread out in the flat Coachella Valley surrounding the summit. The quickest and easiest way back would have been to simply retrace my route which wasn't a bad one at all. But given that it was barely 10a, I took an interest in the narrow canyon immediately SE of the summit. It seemed like the biggest issue would be getting down the initial steep face, after which it looked to be free of major obstacles and would give me a chance to wander down and take my time, the steep walls offering some shade as it was beginning to warm rapidly today. The upper section just below the summit was loose and steep, but with care I was able to drop down towards the canyon to reach easier ground. After about 20min of steady descent I came to the top of a large dry waterfall that could not be descended directly. I moved right (south) to climb up and over into the next gully, got cliffed out a second time, repeated the diversion in the same direction and eventually got my way to the bottom of this cliff section. Below this the canyon became much more enjoyable, following the drainage through twists and turns, negotiating some short dry waterfall sections, all class 3, happy to get occasional shade breaks against the canyon walls. The only serious detraction was some graffiti that appeared, blue spray paint on the rock walls. While it almost ensured I could descend the rest of the canyon, I found it sad that someone had to work their way up the canyon in order to leave a stark, semi-permanent reminder. It appears they had overcome a few tough sections below and felt perhaps they needed bragging rights to the canyon. Wisdom is not wasted on the young. I emerged from the canyon just before 11:30a and with the help of the GPS had no trouble finding where to climb out of the embankment to regain the trails I had used earlier. I got back to the TH before noon and headed back out to the Interstate. My last stop of the day was a visit to a P900, some 65mi further west, in the hills just east of the city of Riverside. Accessed off of Reche Vista Dr, there is an ungated dirt road running steeply to the summit through a series of switchbacks. As far as I could tell there are no trespassing issues and one can drive to the summit with a suitable vehicle. As I was not so equipped, I parked at a dirt turnout just off the pavement, south of the access road. The area is home to a number of ranch homes, some keeping horses, most fairly upscale, but also some long-time residents who probably find the neighborhood getting crowded. As I hiked the road to the summit, I was surprised to note a good deal of horse or burro poop scattered about. The road was also tracked with unshod hoof prints, a sure sign of wild horses or burros. I saw none of the animals on my hike but it seemed an odd place to find such animals in Southern California. A technician drove by in his truck as I made way up. He was in the service shed of the communications tower found at the summit when I arrived after half an hour's effort. There is an older building no longer in service, covered in graffiti that one encounters as well, undoubtedly a popular drinking spot for the younger set. I was unable to locate the Reche benchmark, but I found the highpoint to be a clump of rocks just north of the highest tower. Another point to the SE looked to be of similar height and I checked it out, but according to the GPS it was some 5-6ft lower. I found no register at either site, but didn't really expect to. Views were hazy in all directions which was too bad, because on a clear day it would offer a fine viewspot from which to gaze upon Mt. Baldy, San Gorgonio and San Jacinto at the same time. On the way back I took a slightly different route, avoiding a bit of extra elevation gain and returning to the car from the west through a neighborhood street. The whole outing took just over an hour. Hey Bob - good write up. One thing - the picture you took of the Santa Ana Mtns to the southwest from the summit is actually a picture of the Box Springs Mtns. The Santa Ana's are on the other side through the (seemingly omnipresent) haze. I live about 5 miles from the Reche BM trailhead, and I certainly know, and love, that view. It's a great hike, glad you were in the area. Thanks for that - the Santa Anas would have been too far to see in those conditions. I've corrected the caption.